In today’s hyper-connected, on-demand, digital world, consumers expect immediate satisfaction and access to the services they require. The ability to deliver on these services in real-time requires an increasing amount of speed, relevancy and timeliness to cut through the noise of options and gain allegiance with consumers. The ability to satisfy these real-time needs will be what separates leading companies from the rest in the ongoing quest for customer loyalty. Consumer expectations and patience for certain actions that are dependent on accurate and consistent real-time analysis. The psychological need for immediacy across generations and industries like gaming, financial services, AdTech and telecommunications. 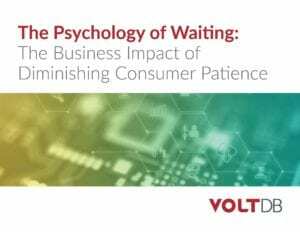 Emotional reactions of consumers when tasks take longer than anticipated. Get the Survey Report Now! Learn how to regain revenue and strengthen your brand!